Dominica - Eighteen months have come and gone since the worst Hurricane in Dominica’s history. The island’s forests, reduced to piles of broken roots and bare branches, have since formed new verdant covers for their brown barks, and life flourishes where fear of death had taken over. Not only is the resurgence astonishing, but it is also a direct reflection of the will of the Islanders. Though the times have been challenging, they have been filled with progress, fueled by the determination of the people, steadied by their unwavering faith in the hope of better days. One of the major collective goals is to become a better nation, the first in the world to adopt climate-smart strategies on a national scale – a grandiose undertaking seen as a necessary push to mitigate against the drawbacks of climate change. Still, with all sectors struggling to recover from the devastation, establishing priority areas for interventions has been difficult for any one institution. Considering, numerous cross-sectoral, public-private agency initiatives have been established within the last year. The Ministry of Information, Science, Telecommunication, and Technology, along with the Ministry of Environment, Climate Resilience, Disaster Management and Urban Renewal, for one, have placed considerable emphasis on improving the national emergency telecommunications network. When Hurricane Maria smashed into Dominica on September 18, 2017, all traditional means of communication went down; some 30 cell sites were destroyed or severely damaged, and the fiber-optic system was severed in several locations, cutting off the island from the rest of the world. Amateur radio operators, an integral component of the emergency network, were able to communicate before, during and after the storm, and were vital in communicating with humanitarian groups and communities about the island-wide crisis. With the support of the International Organization for Migration (IOM) Dominica, the country has made strides to enhance the system by expanding the pool of amateur radio operators and purchasing emergency telecommunications equipment and other technology required. On Wednesday, March 13, 2019, IOM Dominica provided 31 individuals with certificates in Novice Amateur Radio Operations and handed over one of 30 radio units to the Office of Disaster Management (ODM). The activities formed part of an emergency support project funded by The Office of U.S. Foreign Disaster Assistance (USAID- OFDA). The High-Frequency Radio will allow the office to have better communication island-wide and with the rest of the world, even in the absence of traditional communication channels. According to Cecil Shillingford, Disaster Risk Reduction Specialist who works with ODM and is the USAID representative in Dominica, “this unit will be part of the telecommunications infrastructure of the Office of Disaster Management and the Emergency Operations Center (EOC).” Along with the private telecommunication networks, the emergency communications network has been designed to exist within the purview of the EOC. Of the 31 individuals trained in amateur radio procedures, facilitated by IOM and the Dominica Amateur Radio Club Inc (DARCI), 27 are soon to be licensed amateur radio operators. Among them are four members of the Dominica Association of Persons with Disabilities (DAPD). “IOM is proud to have advocated and supported the participation of people who are differently abled for the first time. And we are elated to have included them from the planning phase of this initiative,” IOM Project Manager, Dimitris Champesis, expressed. “This is the beginning, and we hope that we will broaden our horizon so that we would have one trained DAPD [member] in each of the districts. So, if there is an emergency then we would be able to communicate one with another to find out what is going on,” President of the DAPD, Irma Raymond Joseph, shared. 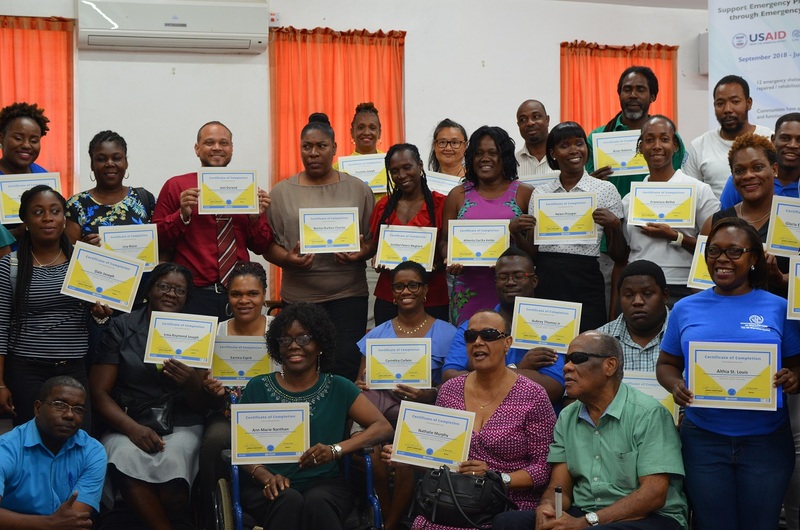 The skills these participants now hold, “will help mitigate the void of isolation we face when we are physically cut off from the outside world,” Executive Director of the National Telecommunication Regulatory Commission (NTRC), Craig Nesty noted. In the last few years, there has been a rapid spike in the number of ham radio operators in Dominica. In 2017 the NTRC received 14 applications and 18 renewals for a total of 34 licensed operators. From 2018 to present, over 82 new licenses and 38 renewals were recorded. Now that more operators have come on board, the focus has shifted on connecting the districts to the EOC in the capital, Roseau. We also want “all the communities linked into the districts and we will use all forms of communications. Of course, whatever fails, fails - but at least we will have something that will work. So, we’ll look at the old conventional telephones, we’ll look at the cell phones, in terms of 2-way radios we’ll look at VHF, UHF and also HF. We’re incorporating satellite phones into the system,” Shillingford stressed. The basis of a successful response of a well-prepared society is, of course, its citizen. IOM is proud to have supported the collaboration between government, civil society, and communities and will continue our effort as the nation strives towards improving its national emergency response system. The organization is also keen on partnering to address the orderly movement of migrants in the region and other issues highlighted by the 2030 Sustainable Development Goals outlined by the United Nations.